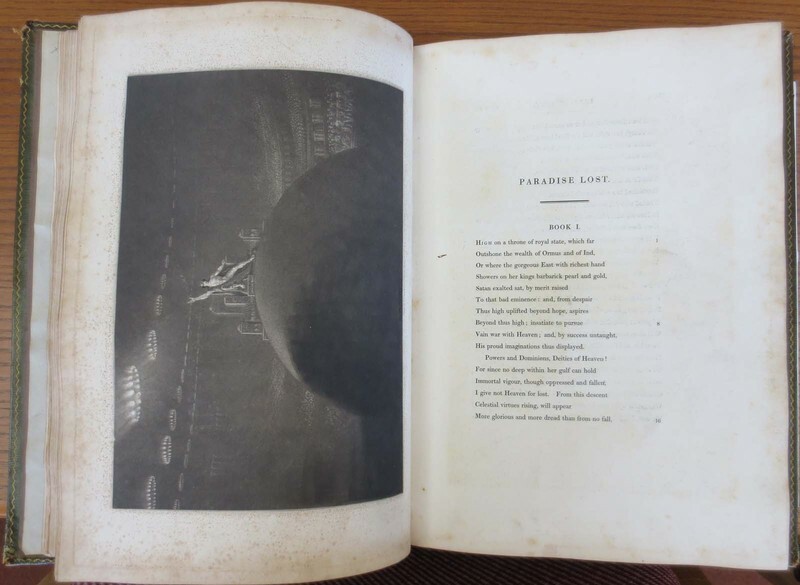 The Paradise Lost of Milton / with Illustrations Designed and Engraved by John Martin. London: Septimus Prowett, 1827. 2 Volumes. 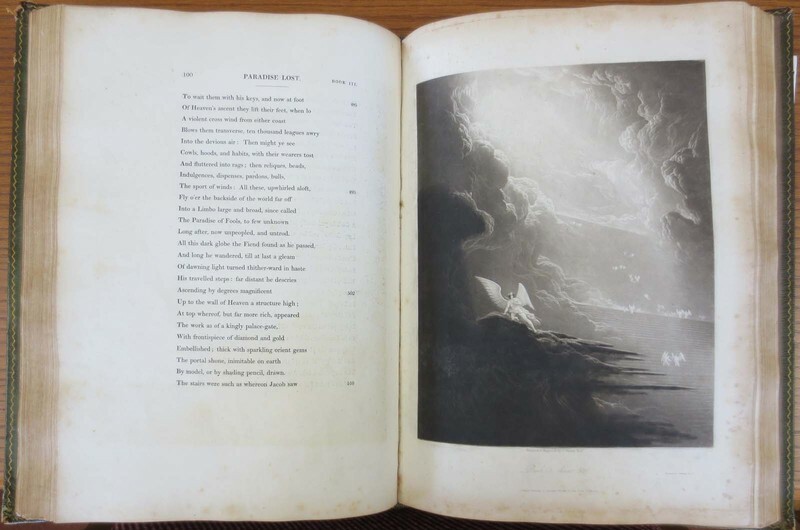 John Martin's illustrations appearing in this luxury two volume edition of Paradise Lost broke strongly with traditional designs and have become noted as a significant milestone in the history of Milton's illustrators. Martin's artistic specialty lay in landscape designs and portrayals which result in an unorthodox deemphasis on the human figure in his illustrations. He also lacked the special spiritual and religious understanding exhibited by Blake and previous illustrators. However, he triumphantly captures the scale of Milton's conceptions in his visionary and grandiose interpretations. Martin used the mezzotint technique for his etchings and also employed a professional printer to assist him in the production of his plates. They may have been issued in album or portfolio form as well, independent of the text. He was also paid an astonishing £2,000 for his twenty-four prints and an additional £1,500 for a smaller duplicate set. This edition was published in three sets, one large run consisting of 1,000 copies and available to the general public for sale, as well as two limited edition runs of 50 copies each for edition subscribers. 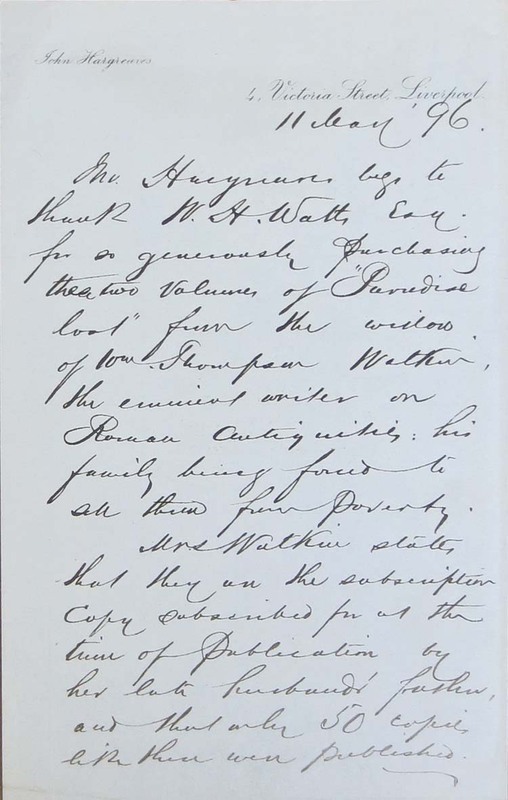 This copy contains a handwritten note regarding the sale of this subscription copy to W.H. Watts in 1896. The copy was sold by the widow of Thompson Walther, whose father was a subscriber of the original issue in 1827.